La Samba 9 Penthouse. This 1 bedroom 1 bathroom vacation rental condo at the start of the Malecon, has been completely remodeled and with it's location, it is an ideal option for your next Puerto Vallarta Vacation. The living room offers you a relaxing couch that actually pulls out into a double size bed. You will be able to enjoy a nice Movie on your large flat smart screen television with netflix or you can just walk out to your terrace, which is above the common area pool and enjoy a nice drink while taking in the amazing view from the connecting balcony that features a table and sitting for a couple, this cute property as well invites you to a roof patio that has a table and 4 chairs, the view from this spot is to the fabulous ocean. The dining room has a table with seating for 4 and flows nicely in to the fully equipped kitchen area with granite counter tops which has a fold up wooden extension for comfortable breakfast bar eating with contemporary style bar stools. A full size refrigerator and electric cook top, are complimented by your everyday use appliances like a microwave, toaster, blender, and coffee maker. La Samba 9 also features an alarm clock with iPhone connection, telephone to make local calls, wifi internet. 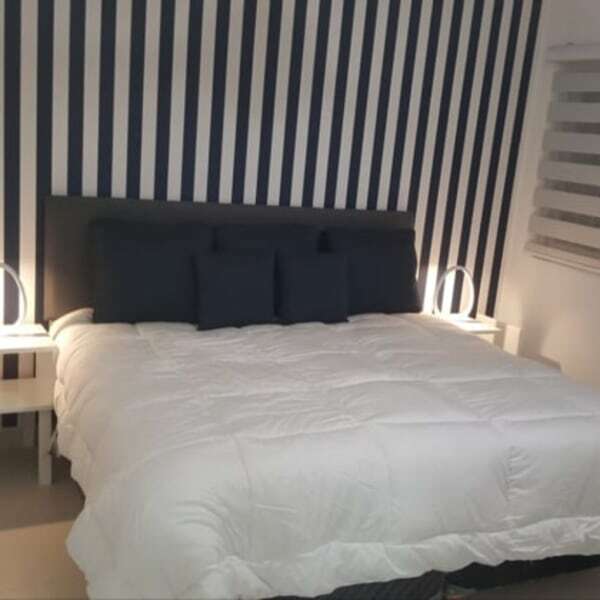 The bedroom is equipped with a very comfortable king size bed, flat screen smart TV with netflix, safe, plenty of closet space and an additional terrace with views to the downtown area and mountains of Puerto Vallarta. you have a local land line and WiFi available so that you can stay connected. Restaurants, bars, galleries, and night life are all within a 5 min walk.